Offers Plenty of Patterning Practice! Wooden spheres, cubes, cylinders & laces. Includes 20 Activity Cards, 108 Beads. Two 36" Black Laces with 1" plastic tips. 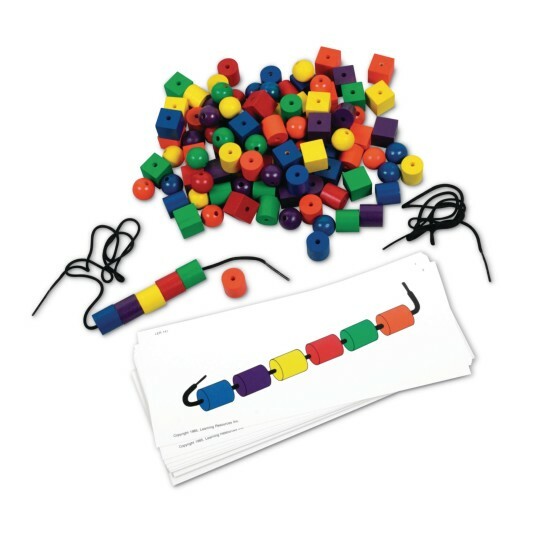 Colorful wooden spheres, cubes, cylinders and laces provide plenty of patterning practice, a prerequisite for early reading and math activities. Set includes 20 Activity Cards, 108 beads in 6 colors, two 36" black laces with 1 plastic tips and Teaching Notes. Bead sizes range from 3/4" to 7/8". Cards measure 4-3/8" x 11-1/4".